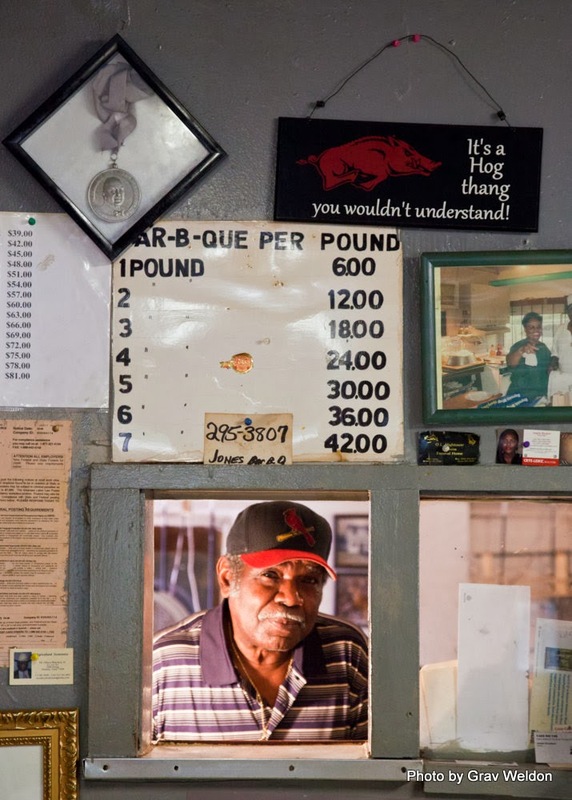 No one knows just how old Jones’ Bar-B-Q Diner is, but Mr. Harold Jones says the recipe goes back 150 years or more. What he does know is that his grandfather and uncle made and sold barbecue from the same recipe he uses today. Everyone agrees that the place was open in 1910, so we can at least surmise that the Marianna staple is past the century mark. 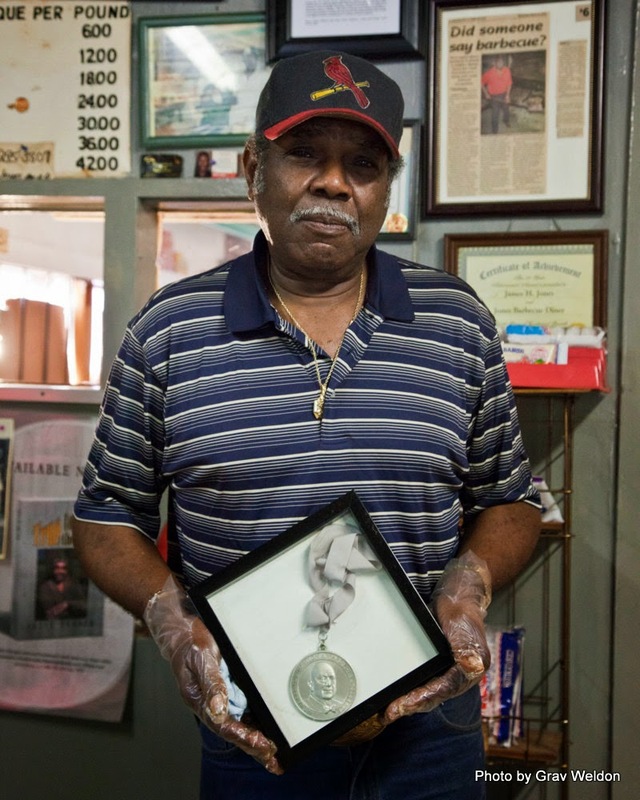 Harold Jones’ grandfather used to go downtown on Saturdays and sell barbecued pork from a washtub out of what folks called “The Hole in the Ground.” On Fridays, he and Jones’ grandmother would sell it out the kitchen door at their home at California and Florida Streets. Jones himself has been in the business since 1968, in what started out as a little one story building on Louisiana Street… a flat-topped one story building opened up in 1964. “I was 14 years old, when they let me outta school when there was too much to cook. Me and my brother got out of school to do it.” Over the years add-ons were built, including a second story where he sleeps when he’s not home with his wife Betty. Every day he gets up and opens at six in the morning. Every day it’s all gone before the lunch hour is over… sometimes it’s gone by 11 a.m., depending on who’s come to town. “Back in May, there were judges who came down to Memphis in May to the big cookoff up there, and they’d ask,” Mr. Harold told me, “they’d ask ‘where’s the best barbecue around here?’ And these guys, these guys who were cooking off, they’d say ‘you have to go down to Marianna,’ and they came. Every day it’s still three dollars a sandwich, six dollars a pound. Sandwiches are made on Sunbeam white bread, always the same – lay down the plate or aluminum foil, put down a slice, heap a mound of pork on it, drizzle on the thin sauce, dollop with sweet coleslaw, top with another slice and wrap. When there’s not someone waiting, Jones keeps making them. He wraps each one in foil and deposits it in an electric roaster. 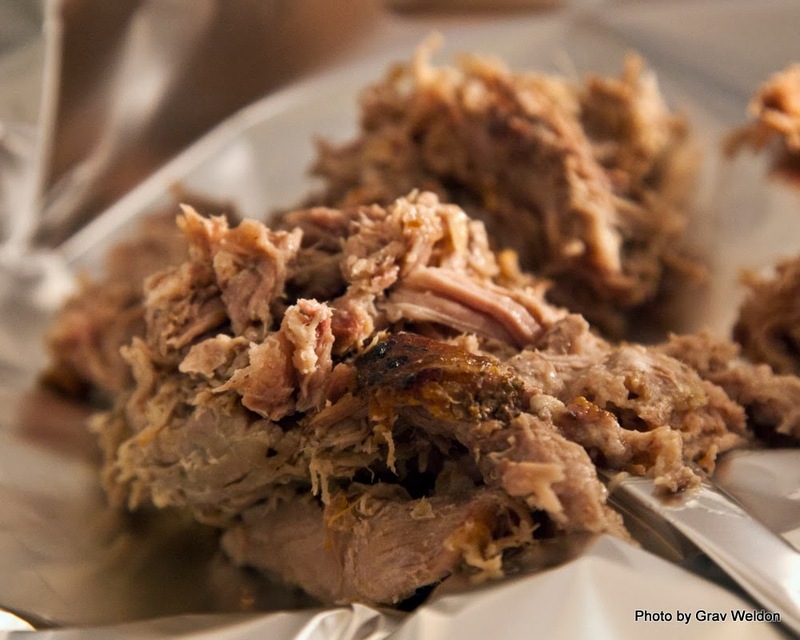 Butts – pork butts, that is – are put on a wire rack in a makeshift pit about eight by 16 feet – that rack looks just like the inside of an old style box spring mattress. The coals come from an old fireplace a half century old or better, hickory and oak burned down until they just gleam red on black from the gray ashes, shoveled into the pit. 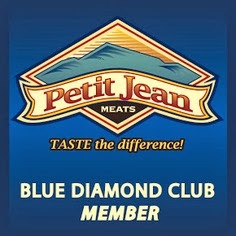 That’s the only heat the meat will get – the slow heat from hot wood, hot made charcoal. A plywood cover on a pulley goes down and the meat smokes. And there’s not much more to it than that. Except the sauce. Jones doesn’t let anyone know the family secret, not even his wife. 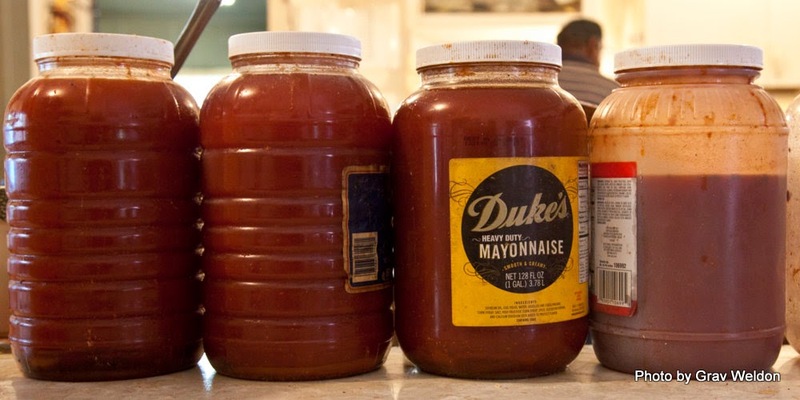 It’s stored in a variety of vessels – gallon jugs formerly used for other items along the back of the kitchen, 16 ounce water bottles for handing out with big meat orders. Out in the dining area, there’s a guest book. It’s a little yellowed but it’s still somewhat new – the smoke probably colors it a bit. Just flip the pages, and you’ll see a random smattering of places beside the names… Stuttgart, Arkansas right before London… New York City. Yemen. Alaska. Memphis. 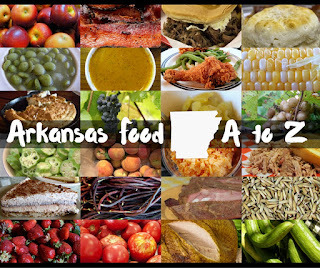 San Francisco and Beirut, Lebanon and Israel and even Japan… a collection of handwritten testaments from travelers the world over who have come to this little two-top diner that’s not even on the main highway in a small hometown in the Arkansas Delta. We got into town at 10:20 a.m. on a Saturday in July, sure as could be that the barbecue was already gone. I could already smell the place before I turned off Alabama Street. Grav had never been, but I had – several times, in fact – which is only equaled in strangeness with the fact that I can’t eat what Mr. Jones sells. I’m allergic to pork. Still, I’d been selling the idea of the place to my photographer for a few days, and when we got out of the car I knew the sale was closed. Grav started popping around shooting the exterior with an urgency of needing to taste what he was smelling. I’ve rarely seen that in humans – usually it’s reserved more for cats hearing the sound of an electric can opener. It’s not that I haven’t had the chance to experience the sauce. 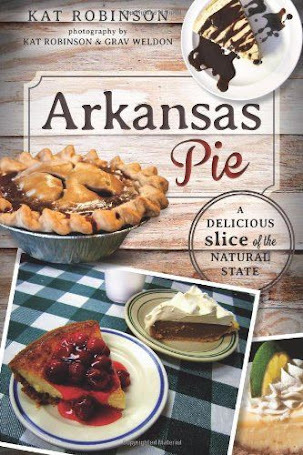 The day Arkansas Pie: A Delicious Slice of the Natural State came out, Kim Williams had brought up Mr. Jones’ good meat. 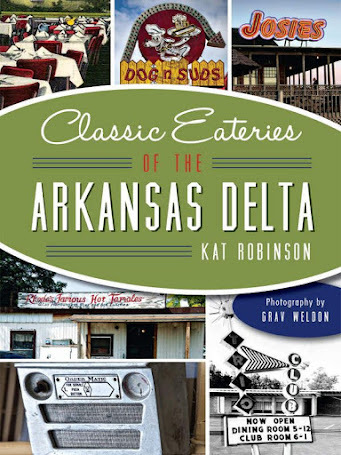 It was the Second Friday Art Night in downtown Little Rock, and Historic Arkansas Museum (which was hosting not just my signing but a second signing and the debut of a Delta art show) was feeding folks his barbecue and fried pies in celebration. Kim also brought along a couple of whole smoked chickens… and Grav and I had our share bare-fingered in the upstairs catering kitchen with a little squirt of sauce here and there, quickly consuming what we could before folks started showing up. It was just as fulfilling as any fine dining experience had been. But still – it took standing in that little parking lot to trigger that reaction. And when we got inside, he was full of questions. Which was good, since Mr. Harold (I have just started to think of him that way, since that’s how Kim refers to him) is quick to answer them. Recognizing the guy with the camera in hand as a newcomer, he stepped out of the kitchen and started talking about the place. He reached up with one hand and plucked a box off the wall above the kitchen window, a black shadowbox frame with a ribbon and a medal in it. It’s his James Beard award. 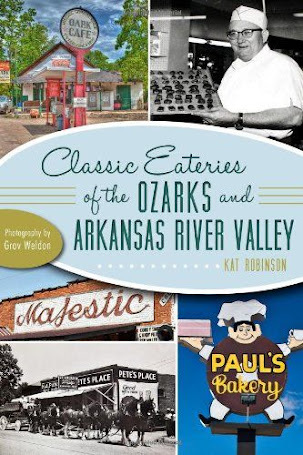 That’s right, the only place in Arkansas to actually receive the Oscar of restaurants is a little white two-story barbecue shack in the Delta. Mr. Harold used to just pull it out and hand it to folks and show it off, but Kim got him the box. That’s a good thing. It’s also a new thing. Before the spring of 2012, no one could imagine such an august award for the place. They just knew the barbecue was good – and cheap. And consistent. Since the nomination, Mr. Harold has been profiled by CBS Sunday Morning, talked with reporters from every variety of press and broadcast and welcomed visitors from Paris, London and Japan. It’s not uncommon for journalists and bloggers to just pop in unannounced. He takes it all in stride. Still, here he was answering questions he must have answered thousands of times by now from yet another guy with a camera. I just took notes and watched. And after showing off the medal and replacing it on the wall, Mr. Harold stepped back into the kitchen, answering even more questions along the way. He stepped back to the counter and proceeded to make yet another sandwich – foil, bread, ‘cue, sauce, coleslaw, bread, wrap, roaster – and another – foil, bread, ‘cue, sauce, coleslaw, bread, wrap, roaster – just automatic as you please. When I finally got a chance to get a word in edgewise, I handed Mr. Harold a five dollar bill and asked if he’d make one for Grav. He handed me change and the photographer a sandwich, nodded to the refrigerator in the dining room and said “get that boy a Coke.” I did, and by the time I turned around Grav had half-inhaled the sandwich. I just saw a grown man fall in love. It was a beautiful thing. His sandwich gone, he wiped his hands, grabbed the camera and looked for more to shoot. He had Mr. Harold hold the medal and shot him, had him stand in the kitchen and peer out the window and shot him again. All the time, the story continued, a story told many times but always with a pride about him. A young woman opened the door and peered in. She noticed me standing there, and Grav and the big camera, and hesitated. “Can I help you, young lady,” Mr. Harold called out to her. “I wan a sannich,” she called back, finally sliding in and closing the door behind her. I could see him making the sandwich the entire bit of conversation, not taking his eyes off her until he went to squirt on the sauce. He had paused that bare second to hear whether she wanted the slaw, and when she answered it plopped down on that meat and the bread was slid on over. It didn’t take him but a second to wrap it and pass it out the door of the kitchen, and she handed him her three dollars in the same motion. And she was back out the door. He let us through the kitchen to the back to see where the ‘cue is smoked. Being now lunchtime on a Saturday, the smoking had ended for the day. Three younger men were sitting around on chairs and an old van bench watching a white television set showing “It’s A Wonderful Life,” I kid you not. One of the guys got up and showed us the pit, which Grav shot. I marveled at the interior of this back screened-in section. Decades of smoke had turned the ceiling a deep-char black – but not just the ceiling. Walls were dark char on wood and stunk of sweet and salt. A window pane in the room with the fireplace was stained with brownish-red flamelike flanges where the smoke had intruded. And it smelled… it smelled like I hope heaven smells. He chuckled. “I’ve eaten so many over the years, sometimes I might eat one, sometimes I might not.” And that seemed to be a pretty good answer. Back in the restaurant itself, we were making our farewells when one of the regulars came in. He grinned and offered testament himself. “I was telling him the other day I ate his father’s barbecue… and every time someone comes in with a camera, he goes and raises the prices!” Both men laughed; the prices haven’t gone up in a long time, and Mr. Harold Jones doesn’t seem to be giving any indication that they’ll change any time soon.